Easily identify a visitor with these affordable preprinted lanyards. Lanyards are an efficient method of displaying identification in the workplace. This lanyard is blue with the word “NHS” printed in white. Pack Size: 10 or 25. Lanyards are used for a variety of reasons, by organisations across all industry sectors. They are an efficient method of displaying identification. This preprinted lanyard incorporates a Breakaway Breakaway safety featureBreakaway safety features are a plastic mechanism designed to pull apart when force is applied, helping to protect the individual. For example, if the lanyard becomes trapped in machinery then the breakaway feature will detach and pull apart, freeing the individual. safety feature. The plastic clip allows for easy attachment of Badge Holders or PVC Plastic Wallets. 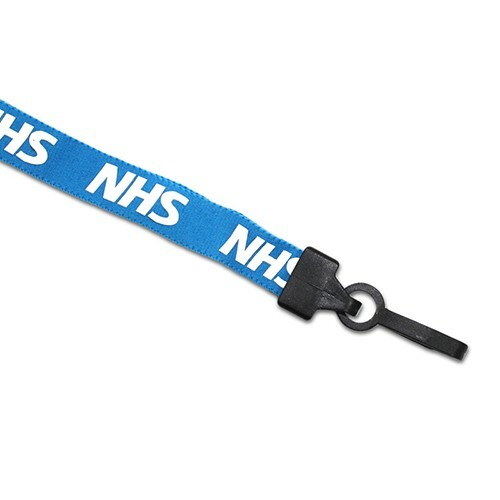 This blue lanyard is 80cm long, 15mm wide with 'NHS' printed in white letters. To find the colour that matches your brand browse our range of Lanyards.